Yellowstone National Park. I’m not sure what the network situation is there, but I’m not expecting much. Unfortunately, this year I didn’t have time to prepare some reruns of old posts before I left. If I manage to find a data connection, I’ll try to schedule some interesting reruns. But don’t hold your breath. See you in september! This entry was posted in Meta and tagged Meta on August 24, 2007 by markcc. short. A digraph is a graph where each edge distinguished between its source and its target – so an edge is from one node, and to another node. 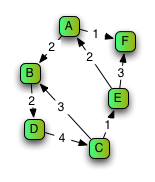 Unlike a simple graph, where if A is adjacent to B, then you can follow the edge either from A to B, or from B to A, in a directed graph, A to B and B to A are different edges. This entry was posted in Graph Theory on August 24, 2007 by markcc. Aside from the Mandelbrot set, the most famous fractals are the Julia sets. You’ve almost definitely seen images of the Julias (like the ones scattered through this post), but what you might not have realized is just how closely related the Julia sets are to the Mandelbrot set. This entry was posted in Fractals on August 22, 2007 by markcc. Yet Another Idiotic "Proof of God"
dreadful thing is posted, thinking that ScienceBlogs have picked up a creationist. Rest assured, this bozo and his blog have nothing to do with our beloved ScienceBlogs (note the “S”); it’s just some jerk who wants to try to capitalize on our reputation. If you want to find the original page, you can go to “scienceblog.com” yourself and find it. I’m not going to link to this slime – his blog name is an attempt to use SBs reputation to pump up his credibility, so I’m not going to send hits his way. This entry was posted in Bad Logic on August 21, 2007 by markcc. This weekend, Seed Media, our benevolent and beloved corporate overlords, sponsored a Scibling gathering: ScienceBloggers from all over the country (and outside) all gathered in New York, ate, drank, and partied. later as I remember more. By the way, that ScienceBlogs mug that Seed is offering to give away in the subscription ads? They gave us each one as a gift, and theyre great. It’s a very nice, heavy glass mug that looks like a cross between a mug and a beaker. This entry was posted in Meta and tagged Meta on August 19, 2007 by markcc. Sonic Youth, “Or”: Very smooth for SY. But great. They’re an amazing band. rock bands. For the Flower Kings, this is a short one at only 10 minutes. beautiful track, featuring steel drums and oboe, and even some light vocals. album. Overall, the “Marbles” album was fantastic, but this track just leaves me cold. couple. Very up-tempo jazzy string-ensemble cover of a Stevie Wonder tune. has a great psuedo-minimalist melodic pulse under it. Very cool. musicians try to an Ornette Coleman style free improv? Weird stuff. of McDonalds. Good song, with a nice guitar hook. example of just why I like this album so much: it’s an 18 minute long opus, just terrific stuff. This entry was posted in Music on August 17, 2007 by markcc. Bad Homeopathic Differential Equations. Yech. standard dilutions are correct. It’s called “The octave potencies convention: a mathematical model of dilution and succussion”, and I got a copy of it via the Bad Science blog. The only part of it that’s depressing is the location of the authors: this piece of dreck was published by someone from the Harvard medical school. Several hypothesized explanations for homeopathy posit that remedies contain a concentration of discrete information-carrying units, such as water clusters, nano-bubbles, or silicates. For any such explanation to be sustainable, dilution must reduce and succussion must restore the concentration of these units. Succussion can be modeled by a logistic equation, which leads to mathematical relationships involving the maximum concentration, the average growth of information-carrying units rate per succussion stroke, the number of succussion strokes, and the dilution factor (x, c, or LM). When multiple species of information-carrying units are present, the fastest-growing species will eventually come to dominate, as the potency is increased. An analogy is explored between iterated cycles dilution and succussion, in making homeopathic remedies, and iterated cycles of reseeding and growth, in bacterial cultures. Drawing on this analogy, the active ingredients in low and medium potency remedies may be present at early dilutions but only gradually come to ‘dominate’, while high potencies may develop from the occurrence of low-probability but faster-growing ‘mutations.’ Conclusions from this model include: ‘x’ and ‘c’ potencies are best compared by the amount of dilution, not the amount of succussion; the minimum number of succussion strokes needed per cycle is proportional to the logarithm of the dilution factor; and a plausible interpretation of why potencies at approximately regular ratios are traditionally used (the octave potencies convention). that this piece of dreck was not too embarrasingly bad to publish. This entry was posted in woo on August 16, 2007 by markcc. This entry was posted in Chatter on August 16, 2007 by markcc. implementing some kind of graph code. in programs, and some of the tradeoffs between different representations. This entry was posted in Graph Theory on August 15, 2007 by markcc. related to the structure of the graph. There are two fundamental orders of graph traversal, known as breadth-first and depth-first. This entry was posted in Graph Theory on August 13, 2007 by markcc.